An April 15 media release from the Refugee Action Coalition in Sydney said, “Around 70 asylum seekers are blockading the Sun compound in the Wickham Point detention centre to try to prevent mostly asylum seeker families from being returned to Nauru. The 70 asylum seekers are also families from Nauru who fear being returned. “‘We are just trying to help each other,’ one asylum seeker told the Refugee Action Coalition, from inside Wickham Point. “The stand-off began about 2pm Darwin time, when Serco officers attempted to forcibly remove people to Sun compound as a preliminary measure to their transfer to Nauru. “Serco had attempted to move a number of mostly Iranian families including children into Sun compound where there is a high security Red section to hold asylum seekers prior to removal. “There are also reports that asylum seekers intervened to prevent the removal following married couples and families being separated by Serco guards, and that there is one pregnant woman among those scheduled for removal. An April 16 statement by the Darwin Asylum Seeker Support and Advocacy Network (DASSAN) said: “The Department of Immigration last night attempted to remove families with small children and a pregnant woman to Nauru. Infants as young as three months were to be included in the transfer. “Despite accepting all recommendations of the Moss Review, with none of the recommendations having yet been implemented, the government continues to transfer vulnerable people to a detention centre where they cannot be protected from harm. “DASSAN continues to receive allegations of physical and sexual abuse at Nauru, and is concerned that no procedural fairness is being afforded to people who are being removed. They are not given a chance to call lawyers or representatives in the community, and are essentially held incommunicado during this process. 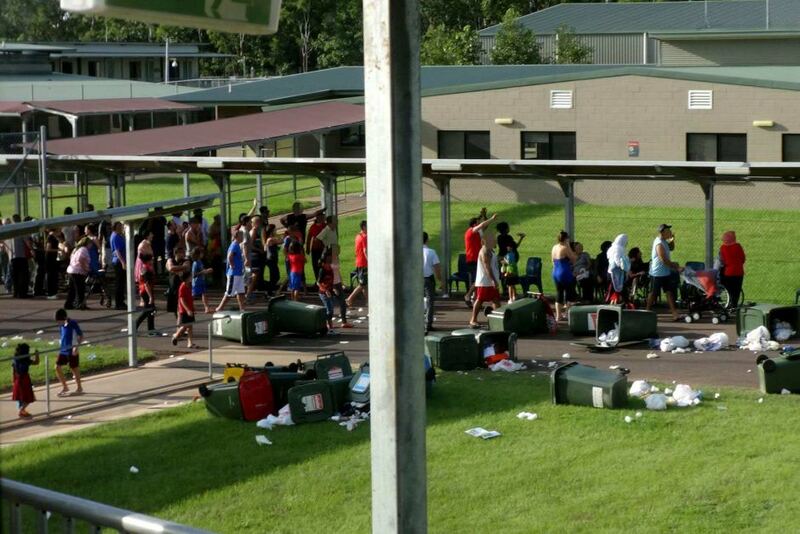 People who are to be transferred are taken into the property area and their personal belongings are packed by Serco. DASSAN responded: “The large police presence confirms the magnitude of the protest. It was not, as the Department called it, a minor disturbance, but a widespread protest against the transfer of especially vulnerable people to Nauru. Asylum seekers who have experienced offshore detention could not stand the prospect of infants and a pregnant woman being returned to Nauru, and their extreme level of anxiety reflects poor conditions of detention and a high risk of harm in the centre. “Following the protest, the pregnant woman and her husband were returned to the compound, however DASSAN remains concerned that young children were transferred to Nauru. DASSAN understands the transfer was rescheduled to take place tonight. “DASSAN members holding a vigil in front of Wickham Point last night witnessed eight marked police cars, five unmarked cars carrying police, an ambulance with trailing vehicle, and a large white van with no windows leaving the centre just after midnight. Greens Senator Sarah Hanson-Young said on April 16, “A pregnant woman, five months pregnant, has attempted to take her own life in the last 24 hours. Another woman, who has recently had a baby, was very, very fearful for what life will be like inside the detention centre,” the ABC reported. Human rights abuses against refugees on Nauru have been directed both at those still in detention awaiting determination of their asylum claims and those who have been found to be refugees and are housed outside the detention centre. Nauru has not offered these refugees permanent resettlement while Australia refuses to take them. The April 15 Guardian reported that “the Australian government has chartered a plane to move the first group of refugees from Nauru to Cambodia within days, according to sources on the island”.